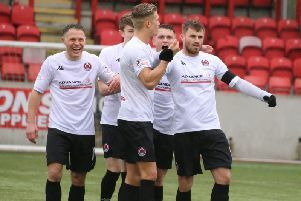 New Cumbernauld United striker Brian Prunty added a double to his debut hat-trick to help his side to a dominant win at Kello on Saturday. On their last visit to Kirkconnel United, despite controlling the game, left with nothing but disappointment to show for all their efforts. But it was different story this time round as Prunty showed the fans why manager Andy Frame was keen to get him to the club. Kello almost gifted United an early goal, a miskick from the goalkeeper landing just outside the box at the feet of Scott McManus who went past a defender but shot wide. Stefan Law was also unable to get a shot on target and Prunty was couldn’t to connect with a superb Paul Callendar ball as United launched attack after attack. The pressure finally paid off in the 19th minute. A ball played into the back post landed at the feet of Prunty who had peeled off the defender and made no mistake. Prunty almost doubled his tally, just a minute later when he fired in a shot with the outside of his right foot, but this time the keeper managed to stop his goal bound strike. However there was no denying the United striker who extended United’s lead with his second goal just before half-time. McManus picked up the ball on the wing and cut back a pass that was met by Kieran McAleenan who had run from deep and his well struck shot flew past the keeper into the corner of the net. United had several chances to extend their lead, the best of these coming from McManus who dispossessed a defender on the bye line before bending a shot that seemed destined for the top corner; unfortunately for him his shot struck the inside of the post before rolling along the line to be cleared by the grateful defender. It was a great all round performance from United with every player doing their bit to secure the win and keep up the pressure on the league leaders . Next up on Saturday is a home game against Dalry with the United faithful hoping for more of the same.